After newly minted light heavyweight champion Mauricio “Shogun” Rua underwent his third knee surgery, UFC president Dana White estimated the Brazilian’s earliest return date would be in March. According to Shogun’s manager, Eduardo Alonso, he is slightly ahead of schedule and could make his first title defense as early as Super Bowl weekend. “I think of the Super Bowl card in February, but this is something that could change depending on his recovery schedule and the UFC’s business schedule,” Alonso told Sherdog.com. 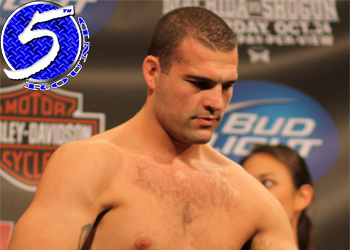 Shogun is expected to break-in his belt against former champ Rashad Evans, who earned the nod by beating bitter rival Quinton “Rampage” Jackson at UFC 114. There is talk that Rua’s extended layoff might force Octagon brass to consider crowning an interim champion to hold fans over, but that’s something Rua and Alonso aren’t focusing on. They know that Rua is the champion and holds the real belt. “The way we see it, unless a champion retires, the interim champion is just another contender,” said Alonso. Rua won the crown by avenging his controversial unanimous decision loss to Lyoto Machida at UFC 104 by knocking him out in the 1stRound of their rematch at UFC 113 this past May.